The town of Somoto is located in the northern hills of Nicaragua approximately 12 miles from the El Espino border checkpoint in Honduras. A relatively quiet Spanish colonial town with a population of only 15,000, it offers a cool climate due to its elevation and surrounding mountains as well as a wonderful retreat away from the bustling cities and stifling heat in the south. But the cool air is not the primary reason why the majority of visitors flock toward this sleepy town. 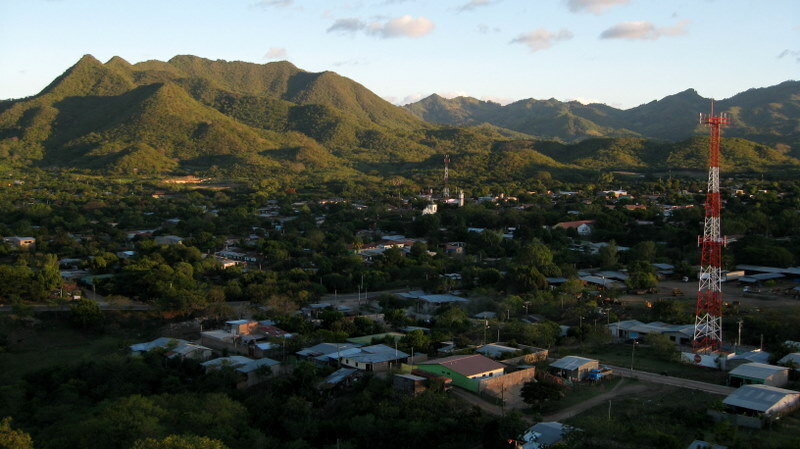 It is home of Somoto Canyon, one of the country’s newest natural discoveries, and where the delicious corn treats known as rosquillas are baked and sold. Originally inhabited by a number of indigenous tribes that included the Chorotegas, the town was eventually constructed in a typical grid-style layout much like the other Spanish colonial cities in Central America. It was officially recognized as a town in 1867 and appointed as the capital of the Madriz department in 1936. During the 1930s, the town saw action especially after the U.S. Marines built an airstrip and small base just three blocks south of the Parque Central (Main Square). 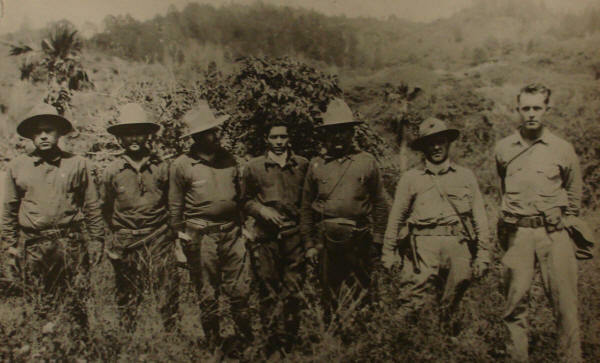 They used the base to launch their unsuccessful airstrikes against Augusto Sandino and his army who were fortified near the town of Ocotal. Today, the town is relatively peaceful and most of the activity is centered on its Parque Central. But when you look around, there are some buildings with proud murals of Sandino and Carlos Fonseca that express the overall political sentiment of its people as well as ones with bullet holes as a reminder of more turbulent times. Mirador – This lookout point is located on a hill at the northeast edge of town. It offers excellent views of the surrounding 900-foot mountains and of the entire town of Somoto down below. Although it can be a fun challenge to hike up the hill, taxis can also take you there for around US$2. 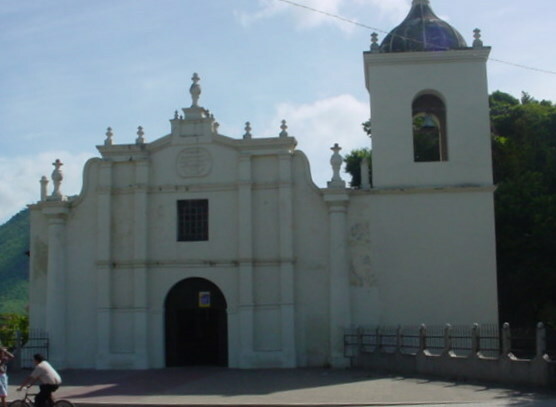 Iglesia Santiago – Located near the Parque Central, this simple but charming church was built in 1661 making it one of the oldest churches in the country. Although the addition of the dome was added in the late 19th century, the lower portion still consists of its original adobe structure. The relatively plain interior includes an altar, sacred vessels and images that are all worth viewing. Piedra Pintada Museum – Located in a small room within the Parque Central, this museum houses a fairly large collection of pre-Columbian artifacts found in and around the city. The pieces range from grinding tools and containers to a variety of religious objects. In addition, it includes many vintage photographs that show the town’s people and significant historical events that helped shape Somoto into what it is today. The museum is open from Tuesdays through Fridays and admission is free. For many years, the town primarily served as just a brief stopping point to get some rest, food, and rosquillas before heading to Honduras. But that all changed in 2004, when a pair of Czech scientists made a geological discovery of a lifetime. 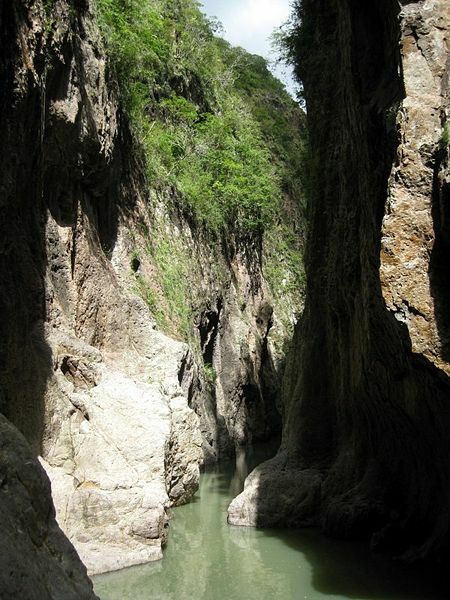 Located eight miles west of Somoto, the Somoto Canyon (also known as the Cañón de Somoto) is a gigantic geological formation where the Río Coco begins. 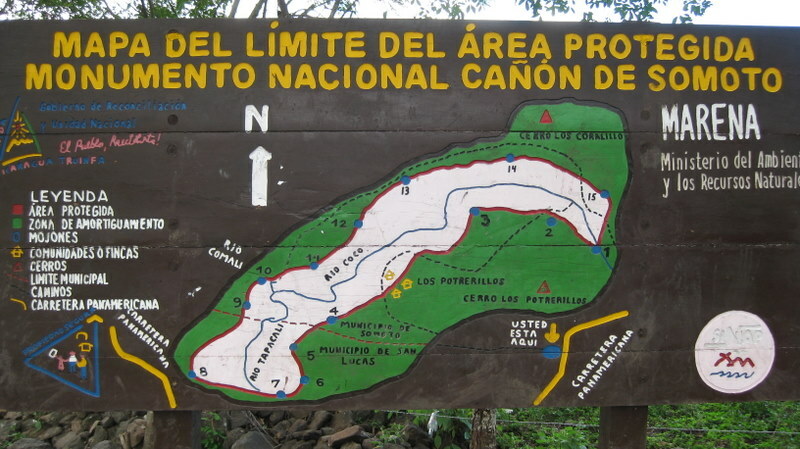 Discovered in 2004 by two research scientists assigned to the Nicaragua Institute for Territorial Studies (INETER), the canyon dates back five million years. It is less than 30-feet wide but it stretches for more than two miles. 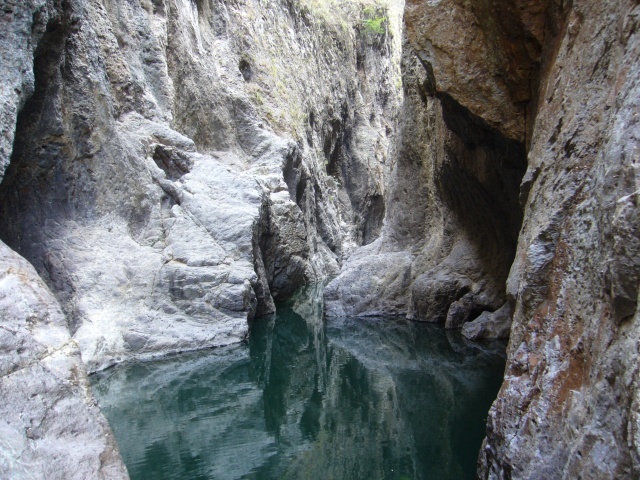 At various points, the solid granite canyon reaches heights of more than 650 feet and includes sheer, jagged cliffs as well as a number of interesting caves. Without a Guide – Generally, self-guided trips begin at the bottom of the canyon at “Point 1” on the map where boats take visitors upstream as far as they can go. 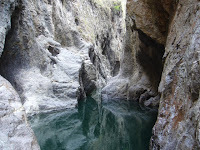 Afterwards, inner tubes are used for flotation for the rest of the journey, since the walls become too steep for walking in the deeper regions of the canyon, which is around “Point 3.” The waters are cold but refreshing and very clean. With a Guide – Subject to change based on your guide’s preferences, a guided journey usually begins further upstream at “Point 4” on the map and continues down through the entire length of the canyon until “Point 1.” An experienced and informative guide will know all of the dangers and risks of the canyon and also provide inner tubes and life jackets. Many towns in Nicaragua are recognized for their specialties that range from handcrafted furniture and rocking chairs to pottery and ceramics. Somoto has earned its place for its nationally known cornbread snacks called rosquillas. They come in different shapes and sizes and they are generally are made from corn, cheese, and herbs, with a few popular versions sweetened by cinnamon and molasses. After a thorough inspection of the corn, only the best grains are selected and cleaned. The grains are then ground and weighed, cleaned and baked, and then re-ground. The rosquillas are closely watched as they are toasted in a wood-burning oven. 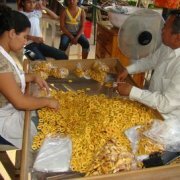 Throughout the rest of Nicaragua, many vendors and larger grocery stores have taken advantage of these marketable snacks by selling bags of rosquillas that claim to be from Somoto even though they are not. But after you taste the authentic version (warm and right out of the oven), you will quickly realize that all of the others are tasteless in comparison.